It is a fact of nature that healthy things grow. As human beings we understand that infants grow into toddlers into children into teens into adults, and so on. We identify the transition from one stage to another as an indicator of growth. In fact, we expect these growth stages to happen. And when they don't happen or are delayed, we suspect something is wrong and we start investigating, whether through our own research or going to a doctor. Of course for a human to grow, the individual systems that comprise our bodies, such as the skeletal, immune, digestive, and nervous systems, have to function properly. If any one of these systems is out of sync or degenerative, we will be unhealthy and our growth could be stunted or we could die. Systems are also the foundation of every business, large or small. These systems, which could also be called operating processes and procedures (written or just understood), allow the business to function effectively (accomplish goals and make money) and efficiently (use as few resources as possible). When any of these systems are dysfunctional or non-existent, the business will be unhealthy and eventually could die (i.e. bankruptcy, liquidation, acquisition). While it's great the number of minority owned firms has increased exponentially over the past 20 years, the focus now needs to shift to growing exponentially more healthy businesses. As I reviewed the recent small business growth statistics, I was astounded to see the high percentage of minority owned firms that earn less than $50,000 per year (see table below). 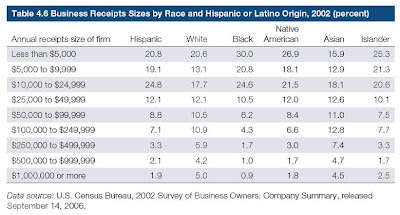 Amazingly, 85.9% of black owned, 76.8% of Hispanic owned, 78.5% of Native American owned firms fall below the $50,000 revenue threshold. From my years of experience as a small business consultant, it is evident to me that a lot of businesses are running without properly functioning business systems. While many entrepreneurs excel in their craft or specialty, some of the essential systems that need to be in place to operate a healthy business are lacking. Many small business owners, whether by choice or ignorance, are not doing enough to position their business for long-term growth. Strategic Planning - The on-going, ever-evolving process of structuring the business internally and positioning the business externally to take advantage of current and future opportunities. This includes managing your business according to your long-term vision, mission and values. People & Culture - People are the most important asset of any company. How are you creating a culture in your business that values, develops and celebrates people? Whether you have 1 employee or 100, your culture should be inviting and empowering. This also relates to how you engage suppliers, customers and business partners. Products & Services - Utilitize creativity and innovation to keep your products aligned with your customers' desires and expectations. You must be able to offer attractive products/services that agree with what your target customers are willing to pay. Customer Relations - Without customers you don't have a business. It is essential that you have a strategic and tactical approach outlined for acquiring, serving, satisfying, retaining and rewarding your customers. Financial Management - For a small business "cash is king". Strategically manage your finances in order to maintain a strong financial position that meets currents needs and positions your business for future growth. Marketing & Advertising - Your company's brand communicates your value to customers. It becomes the launching pad for growth opportunities. Building a strong brand within your target customer market is crucial to growing your company. If potential customers don't understand the value that you provide, then you won't be in business very long. Technology - Don't use new (or old) technology just for technology's sake. Leverage technology to reduce costs, improve products/service, increase productivity, and enhance customer interactions. Many people refer to their business as their "baby" because they have grown it from it's infancy. As I mentioned earlier, when the human growth stages aren't happening in our children as expected, we take them to see a doctor. It's interesting that with our children, although we know them better than anyone else we still go to a baby specialist, i.e. doctor, when something is wrong. It's unfortunate that many entrepreneurs don't do the same with their businesses. Whether out of pride, ignorance or unwillingness to spend the money (invest in their own well-being), they often avoid having a qualified specialist come in and assess their business condition/situation so they can get a prescription for healthy growth. At some point, every business needs a check-up with a business doctor, because no business - large or small - can stay in a stagnant, unhealthy position for very long. Either you're advancing and growing or declining and dying. And with the way that business and the world operates today, you can't be satisfied with what you have accomplished up until today, because that may not be enough to survive for tomorrow. So, what are you doing to grow your business?